The planning and design of OMD dryers range were not carried out in the conventional way but all inalienable requirements were listed and then satisfied. OMD dryers are a combination of applying technical solutions to original designs supported by extensive laboratory testing and achieving the goal of innovative development. The OMD series has been designed and built to expedite inspection and maintenance operations. The easily removed panels offer immediate access to the operating components of the unit. The cleaning of the solenoid drain valve does not require the usage of service tools thanks to the quick “bayonet” valve sistem and the innovative coil clamp. 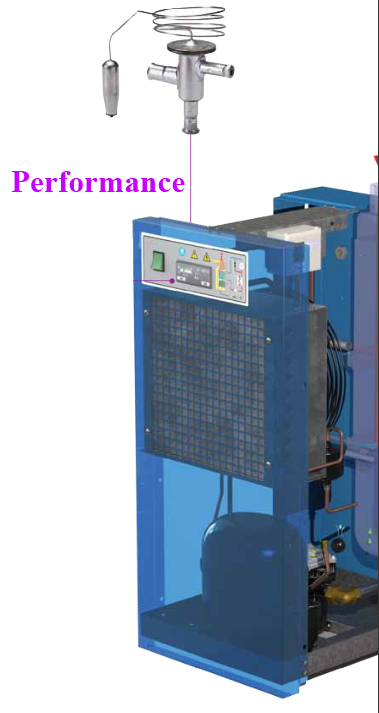 OMD dryers achieve excellent performance even in instances of high ambient and high inlet temperatures. 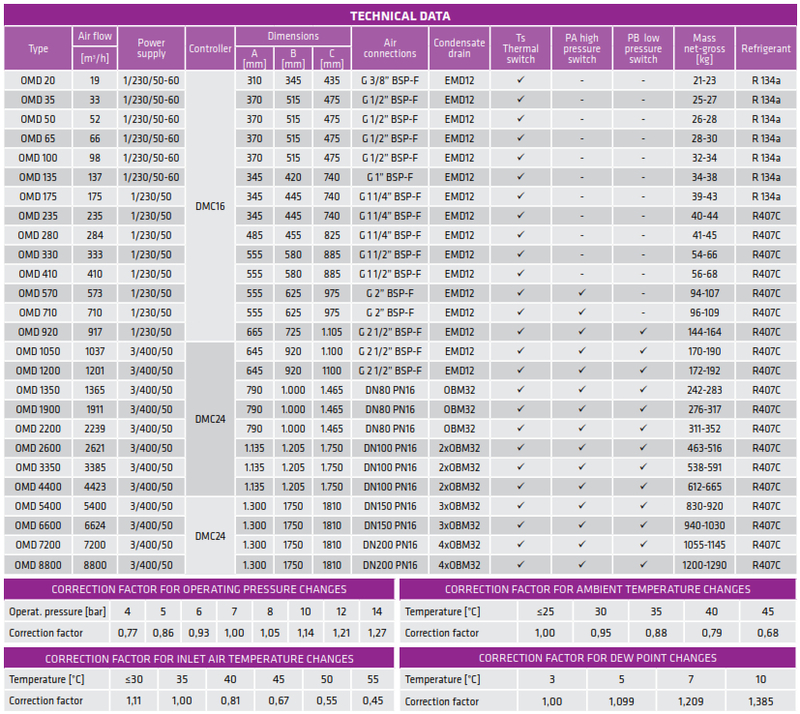 The highly efficient and ultra compact heat exchanger is able to operate effectively in ambient temperatures up to 45°C and inlet temperatures of 55°C, ensuring a reduced compressed air pressure drop. OMD dryers are sized to match standard compressor outputs. E.g. a 15 kW (20 HP) air compressor with theoretical output of 130 m3/h at 7 bar matches the OMD 135 rated at 136 m3/h. 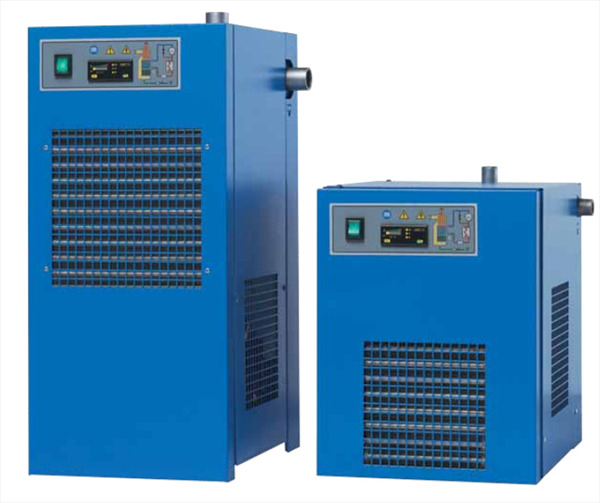 It is therefore unnecessary to select a larger model: air compressor - dryer combination is tested and certified by producer, within operating limits shown on technical features. Operation of the OMD dryer is monitored by DMC16 electronic controller which indicates the DewPoint temperature digitally, controls the condenser fan via a probe. From model OMD 235 the fan is activated by a pressure switch. 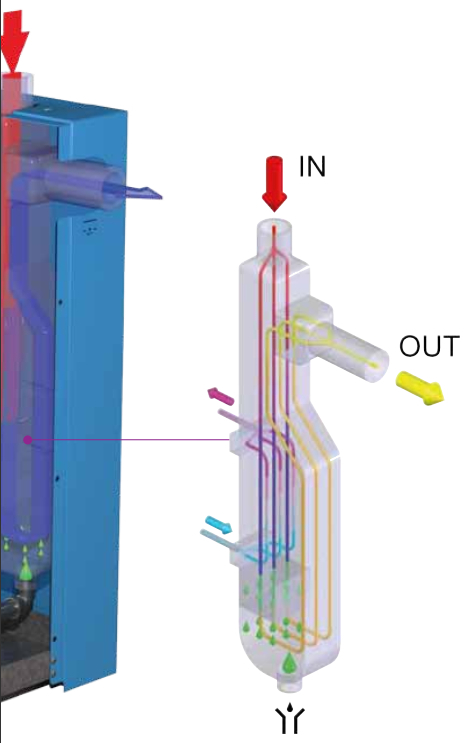 A hot gas by-pass valve allows the dryer to operate at part load and prevent the evaporator from freezing. The ALU-DRY aluminium module has a vertical flow layout ensuring the wet compressed air flows down to the automatic drain. The circulation of the refrigerant in the system is by high efficiency piston and rotary refrigerant compressors which, thanks to their innovative construction have reduced energy consumption and high reliabality levels. All materials used in the construction of OMD dryers have a high recycling factor and in compliance with the producer environmental policy, only environmentally friendly refrigerants are used. Components conform with 2002195/CE “RoHS” (Restriction of Hazardous Substances) and 2002196/CE “WEEE” (Waste Electrical and Electronic Equipment) European Directives.